In her starkly beautiful and wholly unexpected tale, Jackie Kay delves into the most intimate workings of the human heart and mind and offers a triumphant tale of loving deception and lasting devotion. The death of legendary jazz trumpeter Joss Moody exposes an extraordinary secret, one that enrages his adopted son, Colman, leading him to collude with a tabloid journalist. Besieged by the press, his widow Millie flees to a remote Scottish village, where she seeks solace in memories of their marriage. The reminiscences of those who knew Joss Moody render a moving portrait of a shared life founded on an intricate lie, one that preserved a rare, unconditional love. Jackie Kay was born and raised in Scotland. She is the author of four collections of poetry: Other Lovers (winner of the Somerset Maugham Award), The Adoption Papers, Off Colour, and Life Mask; almost all of which were collected in Darling: New & Selected Poems. She lives in England. "It has a humanity and sympathy which engaged me from start to finish. 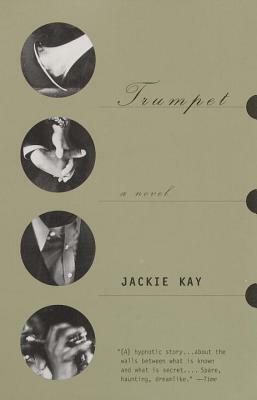 And its energy and directness made it a treat to read. . . . [Trumpet makes] us see that people apparently very unlike ourselves are in fact very much like ourselves. . . . Love is not usually such a triumphant idea in modern writing, but I think Jackie Kay makes it believably and vividly so." "Kay spins a love story, a fairy tale, and a psychological thriller out of one deep secret. She has a great gift for delving inside sundry souls, making poetry of their quirks. At its best, her prose ripples like jazz and brims with exquisite insights."